As soon as we are done with the announcements of first half flagships, attention goes to next devices expected to hit Q3 and Q4. The iPhone is one of them and as has been rumoured the device could come in even larger than the iPhone 5s. You know, for the longest time the iPhone has been the tiny flagship device even as the Android competition hit 5 inch as standard for high end. Only recently did Apple hit 4 inch for the iPhone, previously stuck at 3.5 inches and an argument that the phone needed to be operational with one hand effortlessly. 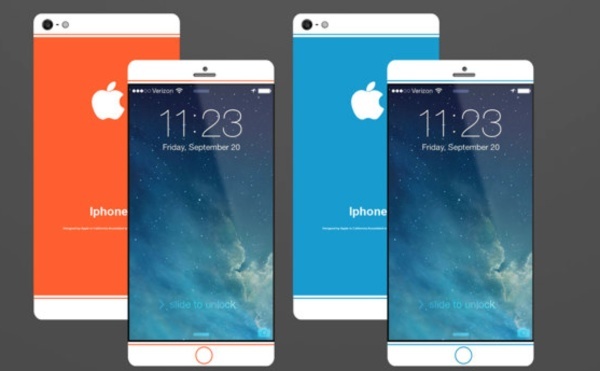 Now as rumours have it, the iPhone 6 will come in two sizes, 4.7 inch and 5.5 inch options. As usual, concepts have always painted the next as a bezel-less smartphone, even going as far as dreaming that the device will have a display that spans even to the sides. This is after Samsung displayed a three sided YOUM smartphone prototype that had the display extend onto the side and other breakthroughs in the display sector. LG has also gone for the flexible display and released the G Flex. Now onto the iPhone concept. It does look like most others mostly with a lot of wishful thinking regarding the smartphone specs. Things like 499ppi full HD IPS LCD display, 12MP camera, Apple A9 chip, 2GB RAM and a 2400 mAh battery with 64 GB internals float around easily with the concepts. This one by concept phones even has more colour and colours not usually expected on the main iPhone, like bright blue and Orange shade. Nokia has been known for colour, but recently Apple and others ventured into bright colours too, I wouldn’t say with much success though. What do you think, would you consider a more colourful, larger iPhone or what are your preferences? A larger iPhone will be a welcome idea for a company that believes in holding onto 3.5-4.0inchers for over 7years now. I’m not a big fan of iOS (ouch, my pocket hurts everytime I see an Apple-branded device) but I strongly believe their users need a bigger device with a re-worked design. You know Apple sells brand, right? That would be Apple yielding to the droids after strongly insisting that small smartphones are optimal.